This sensational contemporary beachfront estate will be an exceptional luxury villa and architectural masterpiece and different from all other villas for rent in the Dominican Republic. From its elevated position next to the waterfront, the newly built 6+1 -bedroom luxury villa enjoys stunning views of the Ocean from almost every room. 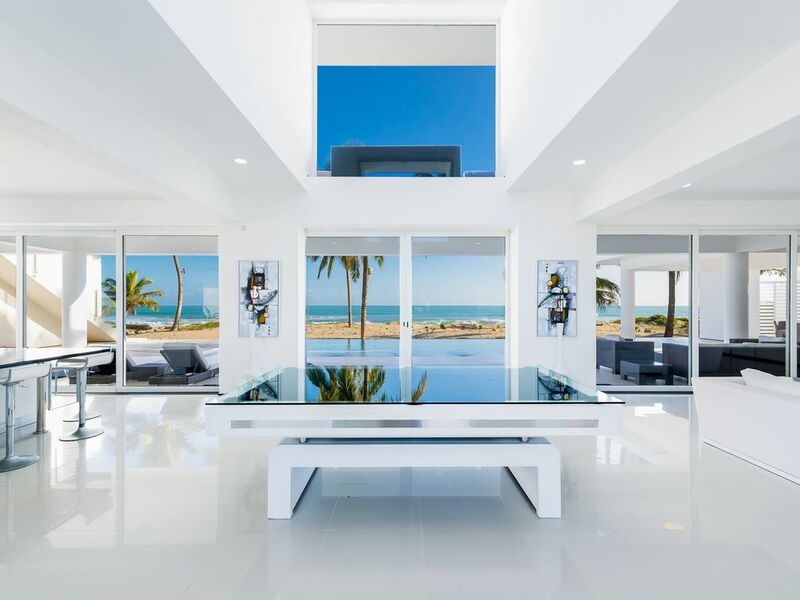 Offering over 9,500 sq ft of modern contemporary living space, the Cabarete property is truly exceptional with a sleek, luxurious ambiance highlighted by quality Italian fixtures and fittings and gorgeous white marble tiles. The fabulous gourmet kitchen with sliding glass doors opening out to the pool and the courtyard is a design conscious food-lover dream. Alexander has a remarkable 15-year track record in the luxury villa market built on an impressive portfolio of holiday homes. With over 15 ‘Best in class’ holiday homes and villas in our portfolio, we are fully equipped to plan your perfect luxury Dominican Republic vacation. We know Dominican Republic; we live in Dominican Republic and we have intimate local knowledge of the island. So if you are in search of comfort, privacy and excellent service, let our ‘Holiday Home Experts’ find you the ideal vacation home to ensure your holiday runs smoothly and is unforgettable. Our team of fun, enthusiastic staff are dedicated to ensuring your holiday experience is nothing less than extraordinary. The Concierge department pride themselves on being experts, and will arrange airport transfers, book rental vehicles, and even pre-stock with groceries prior to your arrival. Other services include dinner and spa reservations, and can extend to include assistance coordinating weddings and special events. We can even arrange experienced and reliable childcare services for the duration of your stay. Whatever your desire, Alexander can guarantee you a remarkable holiday experience! Services Our Concierge Team Can Arrange: • Airport Transfers • Pre-stocking your villa • Car Hire • Dining Reservations • Spa services • Water sports • Reservations • Childcare • Baby equipment rental • Island Safaris • And the list goes on! The Dominican Republic has become one of the best Caribbean island destinations for retirement, and the North coast has a large population of expats from all over the world. Most residential communities offer property management services and also rental service, and Dominicans are very friendly, helpful people. This makes the island a perfect place to go on vacation or purchase your own house or vacation villa. We know and love the Dominican Republic; we know and love our profession and it shows. Your real estate experience, whether the purchase of a new or existing home, the sale of an Island property, or a summer vacation rental, should be both pleasant and rewarding; it should be adapted to your personal style, schedule, and requirements; and it should be FUN. Our clients are important to us and we work hard to ensure your complete satisfaction. Our service standards are among the highest in the industry because we listen to and acknowledge the individual needs of our valued clients. Our villa is "not guest friendly" this information is for single travelers or bachelor party groups !!!!! Our one week vacation in the DR was everything we expected and more. The home was beautiful and very clean. The staff was great and attended to all of our needs and more. Thank you for such a great time. I would definitely recommend this home. Great stay at a beautiful villa! Great stay at a beautiful villa! The property is amazing and the house staff were terrific. Had a wonderful experience. Thank you! From the moment we were picked up at the airport with a big friendly smile from Joel and warmly greeted at the Ultimate Beach House by Alex we knew we were in a special place. The house was simply stunning, the photos don’t do it justice. The beach and ocean views were spectacular and visible from every room! The beach and ocean were only steps away!! The staff Is amazing. The security was always there day and night, but unobtrusive. For our transportation needs Joel was only a phone call away and was always prompt. The pool and hot tub were cleaned daily. The housekeepers Floida and Socorro kept the house cleaned and always with a smile. They also prepared Dominican dishes that would top any restaurant. We highly recommend trying that service. Alex, our family is looking forward to a returning trip. This home and it’s service are highly recommended. Words cannot describe the vacation we experienced. Thanks for everything! Denise group was so friendly, kind, and clean. I really enjoyed having them as guests and would welcome them back anytime! For my wife's 50th birthday 5 couples stayed in this villa. #kier50 It was perfect. Alex, the manager, was responsive and helpful. Joel, the driver was always prompt and gave great suggestions. The house is very safe with a 24/7 security guard. Floira and Socorro, the house rock stars, were amazing! As a group of people who enjoy cooking we somewhat reluctantly decided to have them do the cooking. We bought lots of random items and cut them lose and we were never disappointed! It was easier to give them cash and have them do the shopping as they knew which ingredients to buy - highly recommend that option. The house is beautiful and every room has an ocean view. Everyone commented that their beds and pillows were very comfortable. The master is much larger, but the other 5 rooms are equally nice. First day and a half we had nice calm large waves so we enjoyed some ocean swimming day and night. The wind picked up and the waves became pretty aggressive and choppy. Cabarete is somewhat remote with Sosua, a small town, nearby. Sosua was great for a little shopping and fantastic/incredibly inexpensive dinner at The Mojito Bar (a must - 4:00-8:00 is happy hour and two for one mojitos). 4 of our group of 10 took a horseback riding tour. It was quite the adventure and they loved it!! Everyone ran and/or walked the beaches, laid by the pool, sat in the hot tub, read books, played cards - all in all a perfect trip. The group chartered a snorkeling trip from SOSUA GAME FISHING. Do NOT use this charter. We paid extra to have food and drinks included. This charter, kept us waiting over almost two hours for the boat, ran out of rum in second hour (and only a couple of us were drinking it), had no punch for rum punch, fed us cheap white bread sandwiches (wasn't enough for everyone to have a whole sandwich), and only went slightly outside the cove to snorkel over one isolated tiny reef area. One of the crew must have thought the old farts too boring because he swam to a nearby anchored boat that was partying with their music overpowering ours - which the crew didn't seem to notice or care about. After being just outside the cove for an hour, they brought us back into the cove with 2 hours left of our 4 hour trip, with no food or drinks and little to see on the sandy cove bottom, we elected to end our trip a little early. This was our only disappointment during the trip. Gracias - Alex, Joel, Floira, & Socorro! We had an amazing stay at Villa Ultimate. The house has amazing views, and it was large enough to accommodate our big group of 15 people. Soccoro and Floira were so nice. They cooked delicious meals for us. Alex, the house manager was very responsive and helped us with good recommendations. The beach was a little rough with big waves but the kids had so much fun. Such a great vacation. We would definitely go back to this villa. There were 6 families that enjoyed this unit. The home is beautiful and very comfortable. The staff were attentive to our every need and Joel the taxi driver not only provided transportation on request but acted as a travel guide for restaurants and places to visit. We all agreed that we would stay here again.